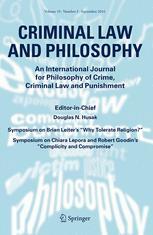 "Bennett's Expressive Justification of Punishment"
Abstract: In this paper, I will critically assess the expressive justification of punishment recently offered by Christopher Bennett in The Apology Ritual and a number of papers. I will first draw a distinction between three conceptions of expression: communicative, motivational, and symbolic. After briefly demonstrating the difficulties of using the first two conceptions of expression to ground punishment and showing that Bennett does not ultimately rely on those two conceptions, I argue that Bennett’s account does not succeed because he fails to establish the following claims: (1) punishment is the only symbolically adequate response to a wrongdoing; and (2) punishment is permissible if it is the only symbolically adequate response to a wrongdoing.